When a manuscript of a book to be published comes across my desk, there is always a sense of anticipation. My job, as book designer, is one that I still relish even after 25 years. When I started out at David R. Godine, and later at Little, Brown/Atlantic Monthly Press, the very first list of books I worked on read like a pantheon of literary gods/goddesses: Charles Baudelaire, Brendan Behan, John Hawkes, Norman Mailer, Thomas Pynchon, Andre Dubus (Sr.), William Shirer, the Nobel-prize winning poet, Vincente Alexandre, Ursula LeGuin, Mary Oliver, and more recently the Dalai Llama. I used to ask myself why I didn’t pursue my own writing career (I was published in Mademoiselle magazine while I was an undergrad at Middlebury, and ‘almost’attended the University of Washington to study with David Waggoner… But writing eluded me, quite frankly, and it is only in my fifties that I began to relax enough to write freely and not care about getting published). However, I have been fortunate to have actually helped bring the writers’ words to the printed page. Sometimes I engage in a dialog with the writer whose book I am working on. 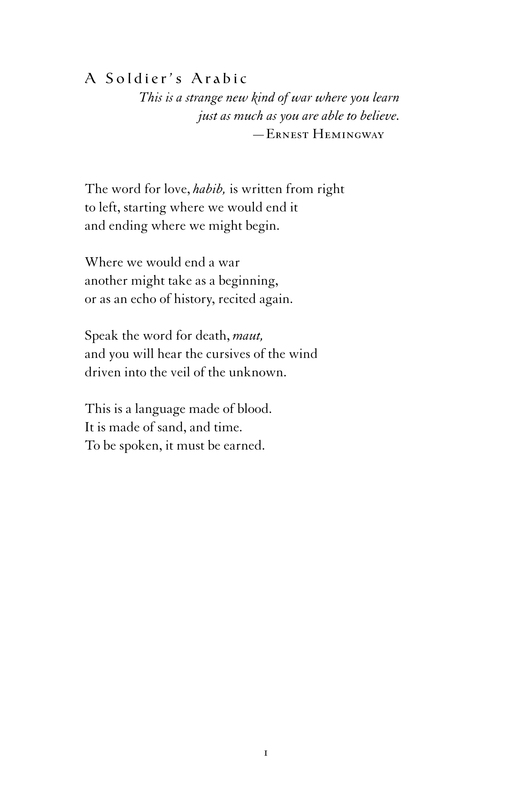 William Shirer and I conversed regularly, and Mary Oliver conveyed what she wanted to me succinctly (she loved Perpetua for setting her poems, but any “italics had to be one-point larger”) through her editors at Beacon Press. Even the elusive Thomas Pynchon sent me a note through his editor (Roger Donald) at Little, Brown, complementing me on my design of his book, Slow Learner. In a surprising typed note he sent to me, Pynchon wrote that I made his work “appear better than it really was”! 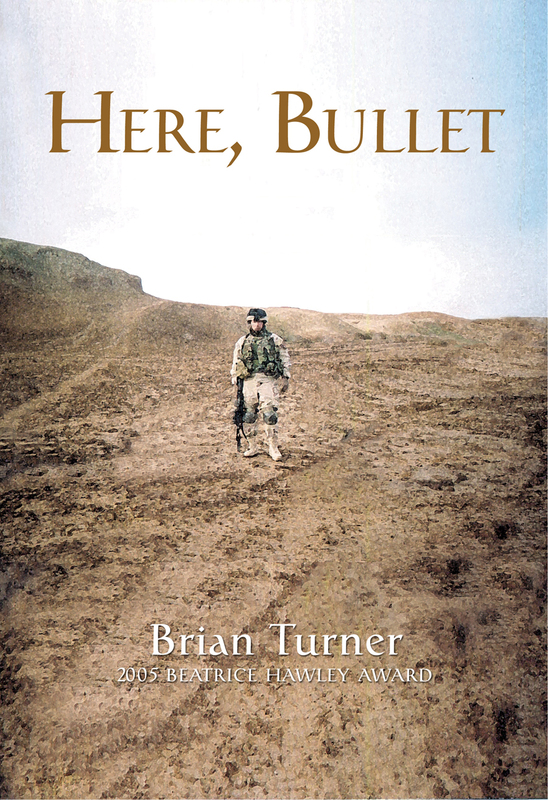 Nearly all of Brian’s Turner’s poems were written while he was in Iraq. They emerged from a place of both experience and imaginings—he was a participant and observer in the true Wordsworthian sense and, luckily, he survived this doomed war unlike other poets before—Wilfred Owen comes to mind. Captain (aka. “The Professor” as he was known by his platoon) Turner stands firmly as a poet of his generation, one who is rooted in academia and as a leader and inspiration to a group of soldiers and armchair readers alike. When Brian wrote that he was pleased with my design of his book, I was very happy indeed (and he inscribed my book in person at the Brattleboro Literary Festival in 2006). 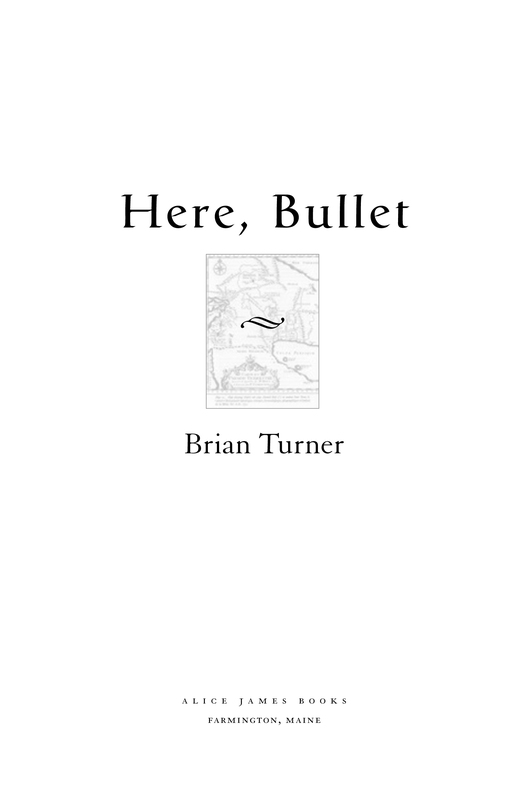 In one of the last poems in Here, Bullet, Turner writes, “I have no words to speak of war.” But, oh yes, he does, and I am honored to help bring those words to life.